If the vehicle gets stuck in fresh snow or mud, the TRAC/VSC systems may reduce power from the engine to the wheels. You may need to turn the system off to enable you to rock the vehicle in order to free it. Quickly push and release the switch to turn off TRAC. The “TRAC OFF” indicator light should come on. Press the switch again to turn the system back on. 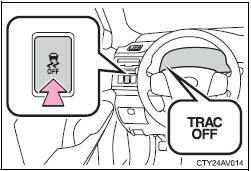 Push and hold the switch for more than 3 seconds while the vehicle is stopped to turn off TRAC and VSC. The “TRAC OFF” and VSC OFF indicator lights should come on. Press the switch again to turn the systems back on. TRAC cannot be operated. Contact your Toyota dealer. ●A sound may be heard from the engine compartment when the engine is started or just after the vehicle begins to move. This sound does not indicate that a malfunction has occurred in any of these systems. ●Any of the following conditions may occur when the above systems are operating. None of these indicates that a malfunction has occurred. • Vibrations may be felt through the vehicle body and steering. • A motor sound may be heard after the vehicle comes to a stop. • The brake pedal may pulsate slightly after the ABS is activated. • The brake pedal may move down slightly after the ABS is activated. When the steering wheel is operated, a motor sound (whirring sound) may be heard. This does not indicate a malfunction. 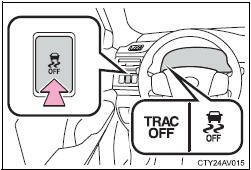 Turning off the engine after turning off the TRAC/VSC systems will automatically reactivate them. When only the TRAC system is turned off, the TRAC system will turn on when vehicle speed increases. However, when both TRAC and VSC systems are turned off, the systems will not turn on even when vehicle speed increases. The effectiveness of the EPS system is reduced to prevent the system from overheating when there is frequent steering input over an extended period of time. The steering wheel may feel heavy as a result. Should this occur, refrain from excessive steering input or stop the vehicle and turn the engine off. The EPS system should return to normal within 10 minutes. It may indicate a malfunction in the TRAC and VSC. Contact your Toyota dealer. ■ABS does not operate effectively when ●Tires with inadequate gripping ability are used (such as excessively worn tires on a snow covered road). ●The vehicle hydroplanes while driving at high speed on the wet or slick road. ●When driving on dirt, gravel or snow-covered roads ●When driving with tire chains ●When driving over bumps in the road ●When driving over roads with potholes or roads with uneven surfaces ■TRAC may not operate effectively when Directional control and power may not be achievable while driving on slippery road surfaces, even if the TRAC system is operating. Do not drive the vehicle in conditions where stability and power may be lost. ■When the VSC is activated The slip indicator light flashes. Always drive carefully. Reckless driving may cause an accident. Exercise particular care when the indicator light flashes. ■When the TRAC/VSC systems are turned off Be especially careful and drive at a speed appropriate to the road conditions. As these are the systems to ensure vehicle stability and driving force, do not turn the TRAC/VSC systems off unless necessary. Make sure that all tires are of the specified size, brand, tread pattern and total load capacity. In addition, make sure that the tires are inflated to the recommended tire inflation pressure level. The ABS, TRAC and VSC systems will not function correctly if different tires are installed on the vehicle. Contact your Toyota dealer for further information when replacing tires or wheels. ■Handling of tires and suspension Using tires with any kind of problem or modifying the suspension will affect the driving assist systems, and may cause a system to malfunction.